New stone villa, very peaceful, high standard, large patio, real countryside. Family-friendly. Access for wheelchair. The owner-family lives in the property and looks forward to be at your disposal for all your needs. Each villa contains two airconditioned bedrooms ( one kingsize double bed, one two single beds) one large livingroom with open kitchen, one bathroom with jaccuzy and a large shadowed veranda. Our family is living since 15 years in the village Orhaniye and we love the peaceful rural surrounding of the Datca and the Bozburun Peninsulas. To spend time in Sakin Vadi means to share our different kind of living - time for a glas of tea while sitting in the shadow of the avokadotree, time for a little talk with neighbours, time for watching the stars while swimming in the pool, time for ejoying dinner at the beach, time for yourselfe. Bathroom with shower is wheelchair accessible. Vielen Dank an dich und deine Familie. Dear Joanna, thank you so much. We love to see you again and hopefully learn more about your fantastic activities in hospiz. I was looking for a quiet rural place near the sea and I found it in Sakin Vadi! Vera and Muttalip are the most warmest hosts I ever met. Their three holiday houses and their own house are situated around a pool in middle of a vineyard and beautiful garden where you are allowed to collect fruits or herbs for your meal. Vera and Muttalip told me where to go to explore the environment, to find hidden places to relax or swim and the most beautiful was a daytrip on their sailboat Viva with Muttalip as Captain and a superbe picnic from Vera. I am sure I will spent more holidays in Sakin Vadi. We discovered the wonderful Bozburun Peninsula last year while staying in a hotel in the area. This year we wanted something more personal but in the same location. We discovered Sakin Vadi, three villas around a pool with the owners house onsite. A beautiful location up in the hills surrounded by nature, It was an amazing find. Vera and Marco were such welcoming hosts and immediately treated us like friends visiting their home. Their ethos is to share with people their love of this beautiful area and they really are the warmest people you could wish to meet. We went on a wonderful trip on Marco’s yacht is not your average boat trip...we were out on the yacht for 11 hours and watched the sun set from the boat...it was wonderful... there was none of this following the same route as other boats, that we have experienced in the past...we just were out on our own, swimming in clear blue seas….pure heaven!!! Joseph loved the little gecko that joined us for breakfast each morning! The accommodation itself is spacious, clean and very well equipped and the shared pool is great for a dip after a day out. We loved the mosquito net...what a treat!! The area around is wonderful to explore and Vera directed us to the beautiful Ciflik which became our favorite beach. You can also easily get to Datca in a day and we were able to explore the ruins at Knidos and we were then able to stop off at the beautiful Palambuku beach on our way back. 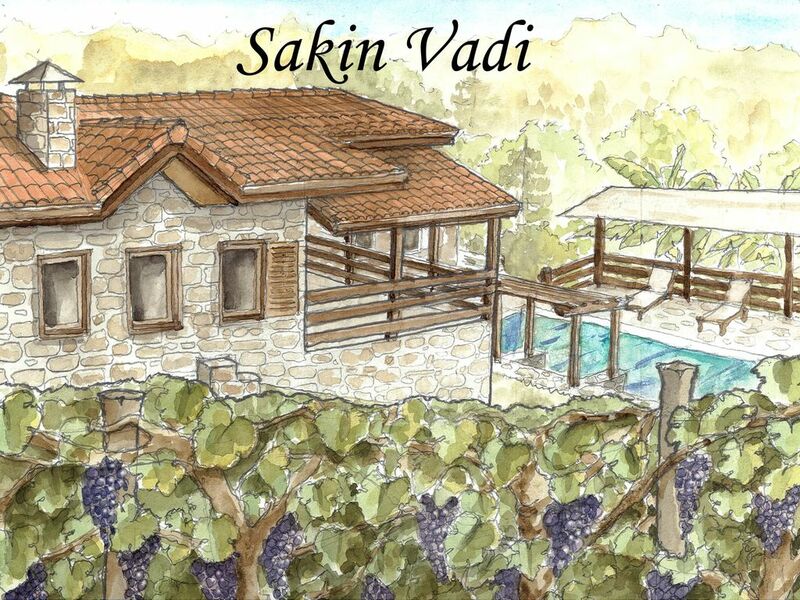 Thank you so much Vera, Marco, Ferdi and Deniz, we cannot wait to return to the beautiful aSkin Vadi! We (a family with one teenage daughter) stayed in Sakin Vadi for two weeks in August and had a wonderful time. The villas are beautifully designed, spacious, clean and well equipped. They are set within lovely gardens surrounded by a vineyard, fruit trees and chickens. The area is very rural and unspoilt and a car is essential to visit nearby beaches and towns. Selimiye and Bozburun are well worth a visit for an evening meal but generally this a real 'get-away-from-it-all' destination. The four days we spent on Mutalib's sailing yacht have been a real highlight of the holiday. The boat is fairly basic with only a hosepipe for a shower and a small shaded seating area but we had the most wonderful time sleeping on deck under the stars and swimming in the crystal clear waters of the many secluded bays that are only accessible by boat. Mutalib is a fantastic cook and managed to rustle up the most delicious meals in the tiny kitchen. Vera, Mutalib and their two sons Deniz and Ferdi are the perfect hosts- they made us feel more like friends than paying guests. We definitely hope to return! Sakin Vadi is a small valley in the village Orhaniye in the Southwest of Turkey. Our neighbours are flocks of goats and tortoises and anyway in five minutes you are on the beach. Each Saturday a farmers' market take place on the village square. Our guests can use for free the beach and all facitlities of our restaurant Sakin Vadi Winehouse, close to the famouse sandbank Kizkumu in Orhaniye. If required we help you to organize excursions in the surroundings like a day trip to the famous archaeological site of Knidos or a cosy boat trip to a lonely bay for a piknik. Nevertheless in 25 minutes you are in Marmaris, where you can find everything you wish: Shopping centres, daily Bazar or if needed medical care in European standard.